It is the deadliest militant attack in modern Egyptian history. Bir al-Abed is about 130 miles (211km) from Cairo. Locals are quoted as saying that followers of Sufism, a mystical branch of Sunni Islam, regularly gathered at the mosque. Although Sufis are widely accepted across much of the Muslim world, some jihadist groups, including IS, see them as heretics. The head of IS's religious police in Sinai said last December that Sufis who did not "repent" would be killed, after the group beheaded two elderly men reported to be Sufi clerics. The victim of the mosque attack also included military conscripts. Who might be behind the attack? Militant Islamists have been waging an insurgency on the Sinai peninsula in recent years, stepping up attacks after Egypt's military overthrew Islamist President Mohammed Morsi after mass anti-government protests in July 2013. Hundreds of police, soldiers and civilians have been killed since then, mostly in attacks carried out by Sinai Province group, which is affiliated to IS. In September, at least 18 policemen were killed when the group attacked a convoy near al-Arish. Sinai Province has also carried out deadly attacks against Egypt's Coptic Christian minority elsewhere in the country, and said it bombed a Russian plane carrying tourists in Sinai in 2015, killing 224 people on board. It has been operating mainly in North Sinai, which has been under a state of emergency since October 2014, when 33 security personnel were killed in an attack claimed by the group. Sinai Province is thought to want to take control of the Sinai Peninsula in order to turn it into an Islamist province run by IS. Islamist militants have been operating in northern Sinai for several years, mainly targeting security forces. But this is the first time that worshippers inside a mosque have been targeted. The number of victims is unprecedented for an attack of this type. Northern Sinai has been living under a media blackout over the past few years. No media organisations have been allowed to go there, including state-sponsored ones. The frequency of attacks raises doubts about the effectiveness of military operations. While the army releases statements every now and then, claiming victory in some parts of Sinai, there seems to be no end in sight to the ongoing battle between the army and militants. President Sisi has declared three days of mourning. The military is reported to have already conducted air strikes in mountains around Bir al-Abed. "What is happening is an attempt to stop us from our efforts in the fight against terrorism, to destroy our efforts to stop the terrible criminal plan that aims to destroy what is left of our region," Mr Sisi said in a televised address. Arab League chief Ahmed Aboul Gheit condemned the attack as a "terrifying crime which again shows that Islam is innocent of those who follow extremist terrorist ideology". 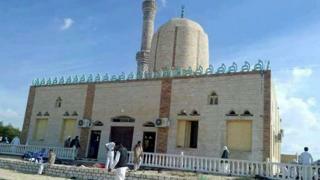 UK Prime Minister Theresa May tweeted: "Appalled by the sickening attack on a mosque in North Sinai. Condolences with all those in #Egypt affected by this evil and cowardly act." US President Donald Trump called the attack "horrible and cowardly".